During the last decade Sony has made large advancements in the imaging arena. Ten years ago, the loyalty lines were still drawn right down the middle between Nikon and Canon. But now is an exciting time for camera technology. There are so many options, and not just cheap alternatives. These are real quality rigs for professionals, and the big brands are scrambling to keep up with some recent tech jumps. We are not knocking Canon, but they have fallen short for our use. Sony started with bells and whistles, then began adding solid processors and optics. Then they announced the mirrorless models, and they haven’t looked back since. We liked what we read and heard, and so we looked deeper into Sony. The amazing reputation of the FS7 first caught our attention. This is a great camera for professional video production houses. It boasts a Super 35mm Sensor, and shoots in 4K XAVC 10-bit. The dynamic range covers an impressive 14 stops, with 12 being really the most usable. In S-Log 3, you have a base ISO of 2000. The footage it captures will impress you. We can shoot slow-motion up to 60fps in 4K, and up to 180fps in Full 1080. The slow-motion feature is used more often than you would think. 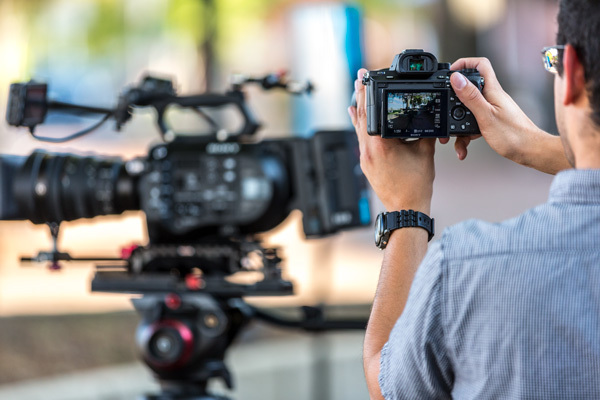 These qualities provide us the confidence to use our FS7 for any shoot. We paired it with our Canon 5D Mark III for a while, but it didn’t take too long to realize the large difference between the two cameras. We were able to match the footage seamlessly, but needed a camera that could compete on a similar level. Sony treated us well with their FS7, so back to them we went. It didn’t take long for our collective agreement to fall upon the a7S II. The dynamic range compares very close to our FS7. It shoots in S-Log 3, and 4K XAVC 8-bit. How this camera performs in low light is where it shines the most. You would be hard pressed to find a dark enough room to render it useless. There is a bonus as well. Sony added 5-axis stabilization to the rig. It was perfect, so we bought it. The body is much smaller by comparison, but it makes up for it with a lot of punch in its amazing results. This addition complemented our other Sony quite well, and we readily assigned them both specific purposes to boost our productions. It’s pretty simple, two cameras provide two functions. The FS7 is our primary, and we use it as such. We typically record all audio through it using a mixer, and sync the footage with the a7S II in post-production. The master shots are all done with the big boy, and our B roll is captured with its little brother. We still use the FS7 with the jib because it’s easier to balance, but we mount the a7S II on the gimbal or the slider for cinematic movement. It’s essential to divide your camera workflow like this to keep a steady and consistent stream during production. We continue to make fine-tuning adjustments, but our two Sony cameras make us a happier production house. The tool will never make the artisan, but they do help—and a good artist desires the best results possible. Years of trial and error provided our team with the talent we facilitate on projects every day. It is that dedication to our craft that makes us appreciate new ideas and new technology. These elements help expand our imaginations to deliver more creative videos. In our hands, these two Sony cameras are more than just useful tools. With them we can make magic, or at least we like to think so.